Hey everyone. Happy Halloween! How was everyone’s October? Good? Productive? Me too. I went to Costa Rica for a week. I had been to Nicaragua in 2009 and assumed that Costs Rica would be a replica of that. Although the backdrop was similar, the people and the culture are different. If you haven’t been to Costa Rica, I highly recommend it. Heck, what am I stammering on about? I should just show you a few pics. People love visual aids. Isn’t this gorgeous? This was our backyard. Well, actually we had a pool in the backyard, but if you walked passed that, you’d run into this. I spent every morning on the beach. I’d eat breakfast, drink margaritas, and pretend that there were paparazzi on shore while I played in the ocean. Ugh. I miss you Costa Rica. This is me in the actual backyard, loving life like an Orange County step mom. I’ve had that hat for forever, and it claims to have SPF 30 woven into it. Do you think it still does after 7+ years? I might need a new one. Our backyard at night. I won’t sully the image with words. 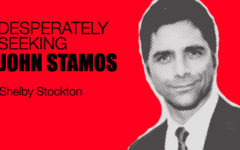 So, when I returned home, I knew I had to do something Stamos related. I feel a bit downtrodden because this goal is harder than I thought it would be. I live in Los Angeles for Christ’s Sake. I should have run into him by now. You know, I’ve never told this story here, but I have been in the same breathing space as Stamos before. It’s true. I was YOUNG, and so was he, I suppose. He was still married to Rebecca. I was at Universal City Walk with my boyfriend (proof that I was young), and we were in the parking garage waiting for our car in valet. (This story is SO LA.) Anyway, I see this tall, skinny blonde and I can’t take my eyes off of her. Everyone’s facinated by models. My BF nudges me and I’m like, “Duh, I see her.” And he says, “No, him. That’s John Stamos.” I didn’t care at the time because I’m a fan of the aged Stamos. That exact same story happened later in that relationship, but we were at a taco stand and the model was Gisele Bundchen and the man was Leonardo DiCaprio. OK. So, I felt I needed to do something to pull me out of this rut, so when I ran errands in Beachwood Canyon, I stapled these all over the place. Days passed. Then I received a Facebook message from an acquaintance that saw them around. He knows a guy who went to high school (or something) with Stamos. OK. Not the strongest lead, but the flyer got a nibble. More days pass. I’m at home, probably watching Netflix and reading a fashion magazine, and I get a text from an old friend. She texts, “Dude, have you seen your FB? Someone saw your flyer and emailed it to JS.” My heart went pitter-pat. Facebook told me NOTHING about this. Long story short (too late), someone saw my flyer, thought it was funny, took a pic of it and posted in on FB, then someone who knows Stamos emailed it to him. AND THEN SUPPOSEDLY someone saw it and emailed it to Bob Saget. But who even knows if any of this is real. Maybe nothing happened. Maybe our existence is a joke and our planet is actually a giant turtle’s glass eye from some other dimension. Somebody is getting cynical. OK, I have to go pack becasue now I’m off to Austin. Wedding. I don’t think I’m that into what I’m wearing but whatever. I’ll keep y’all apprised. Be safe tonight.